Gabriel Snashall ’21 is a Posse veteran studying government and the author of a policy proposal that aims to introduce consumer transparency to the college application process. Similar to a dealership’s sheet on a car window that lists mileage and crash test ratings, Snashall designed a simple form that breaks down the important data on an institution that incoming students should know but often don’t, such as accreditation status and post-grad job placement rates. 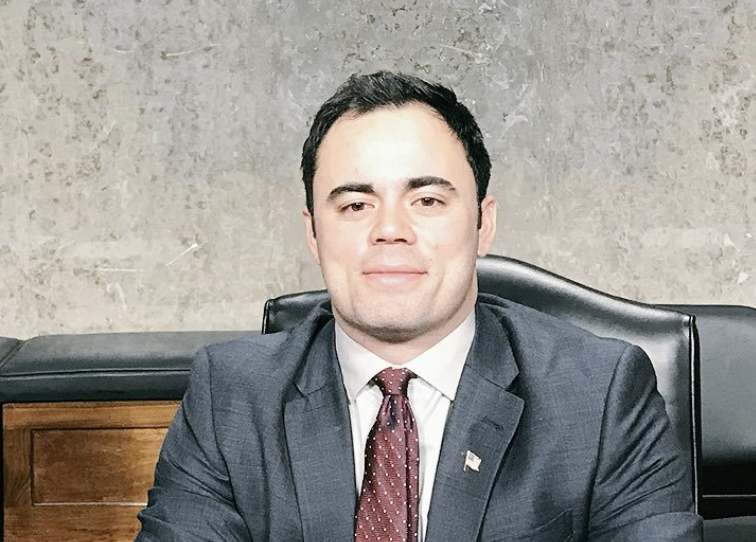 The proposal earned Snashall a fellowship with the Veterans of Foreign Wars and the Student Veterans of America joint legislative group, which later garnered him support from Connecticut Congresswoman Elizabeth Esty. 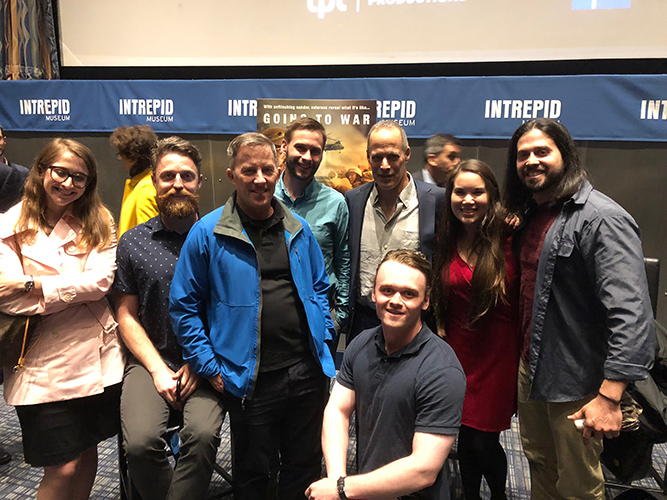 On Sept. 22, several members of the Wesleyan community traveled to New York City to attend the Arts in the Armed Forces (AITAF) inaugural Student Veteran Film Screening. 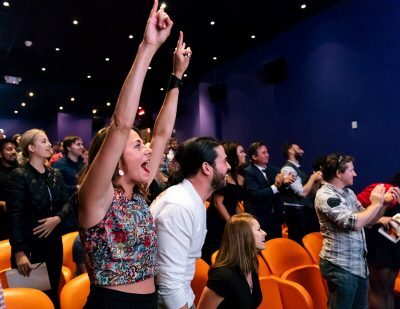 AITAF is a nonprofit organization that brings the best of contemporary theater and film screenings to veterans across the world free of charge. Several Wesleyan Posse Fellows attended the screening. Thirty people from Wesleyan attended, including 17 Wesleyan Student Veteran Organization (WESVO) members; 10 family and friends, 2 nonveteran students; and 1 faculty member. While in New York, the group watched a screening of The Taking of Pelham 123 (1974), a film about a New York City subway train hijacking. The film was recommended to AITAF by actor/producer Ben Stiller, whose father, comedian Jerry Stiller, is a WWII veteran and acted in the film. Ben Stiller and Adam Driver, AITAF’s founder, participated in a Q&A session with the guests following the film. Emmy-nominated actor Driver (Star Wars, Logan Lucky, Girls) was an honorably discharged U.S. Marine who later attended the Juilliard School and found difficulties readjusting to civilian life. However, his experiences with the arts transformed his life. 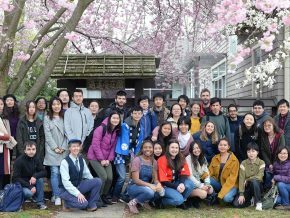 The trip was organized by Wesleyan Posse Veteran Scholar Daní Rodríguez ’20, a 14-year U.S. Marines Corps veteran who interned for the AITAF last summer. While active, Staff Sergeant Rodríguez participated in multiple combat deployments to Iraq and Afghanistan. He’s also been deployed to Korea, Japan, and U.S. Naval Ships abroad. 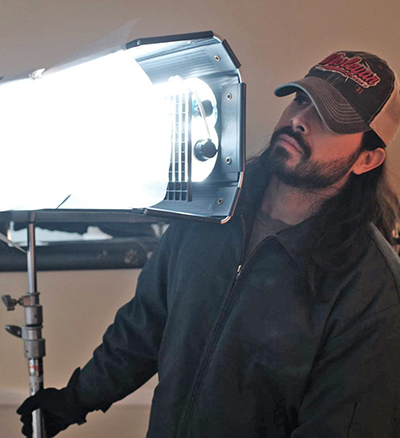 Like Driver, Rodríguez is pursuing film and acting in his post-military life. 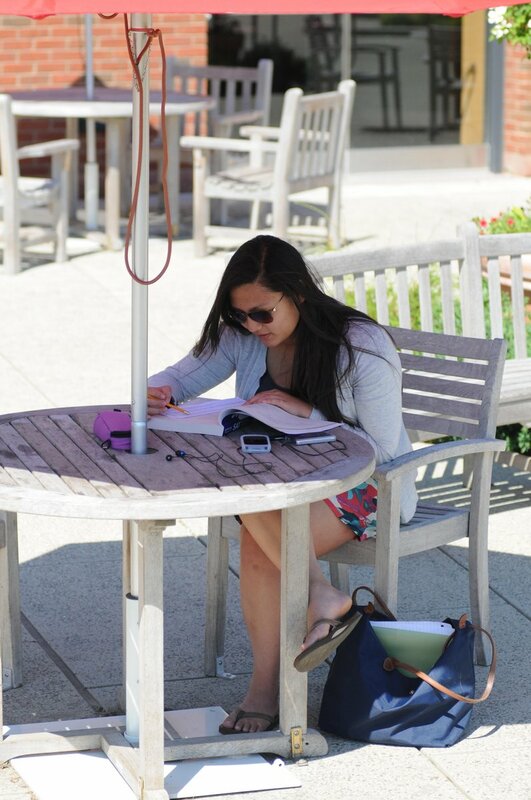 Donning a Wesleyan cap, Daní Rodríguez illuminates a scene for a student’s senior thesis in 2017. Rodríguez discovered that his love for playing guitar and acting could be much more. 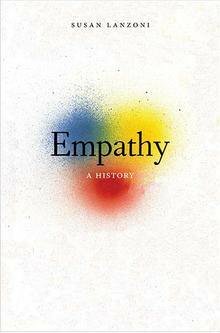 “I quickly began drawing the parallels between those disciplines to the newfound mental stability and empathy that has been transformative. Now, cathartic experiences are frequent in my life and I have become calmer and more articulate about my own emotions,” he said. 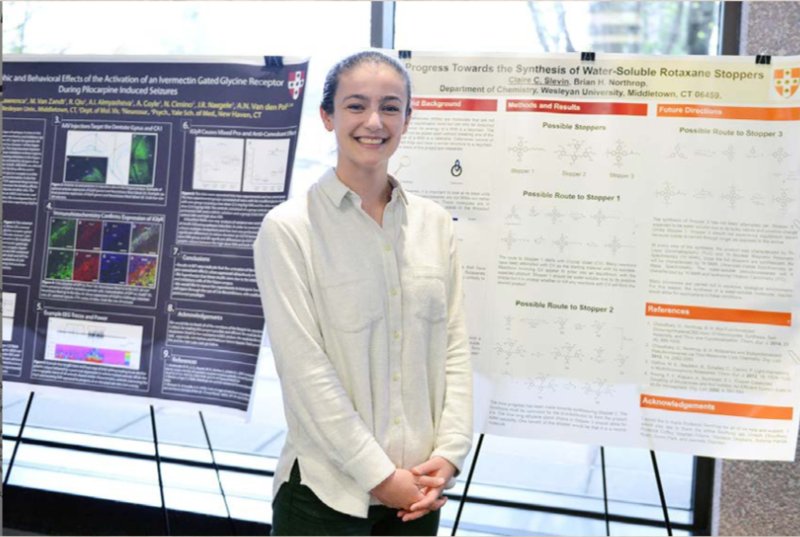 Last summer, Rodríguez received a Summer Experience Grant funded by the Gordon Career Center. With this support, he was able to volunteer with the AITAF and raise awareness of the program through advocacy and outreach. Rodríguez generated interest with fellow veterans at Columbia University, New York University, Pace University, the City University of New York, and others, and ultimately helped create the inaugural Student Veteran Film Screening. 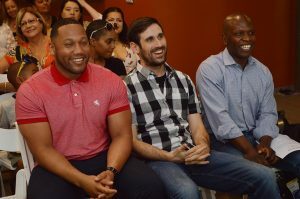 WESVO advisor Robert Cassidy, retired officer teaching fellow, government, and Mike Whaley, vice president for student affairs helped secure funding for the Wesleyan group to attend the screening in NYC. Rodríguez hopes to explore the possibility of hosting AITAF on Wesleyan’s campus in the future. Next summer, Rodríguez will assist AITAF in launching its first student veteran paid-internship program. The Posse Veteran Scholars Class of 2018. As the Class of 2018 accepted their diplomas this month, among them was a special group of students: Wesleyan’s first full cohort of Posse Veteran Scholars to graduate. In 2013, Wesleyan made a commitment to dramatically increase the number of veterans it enrolls by entering into a new partnership with The Posse Foundation, Inc. At that time, Wesleyan was only the second institution to join the Posse Veteran Scholars Program, which identifies talented veterans interested in pursuing bachelor’s degrees, and places them at top tier colleges and universities, where they receive four-year full scholarships. Each year, the veterans enter in “posses” of 10, which act as support networks to help these nontraditional students adapt to college life. As of the 2017–18 school year, Wesleyan has enrolled four full cohorts. One member of the first posse, Ky Foley, graduated a year early in 2017. 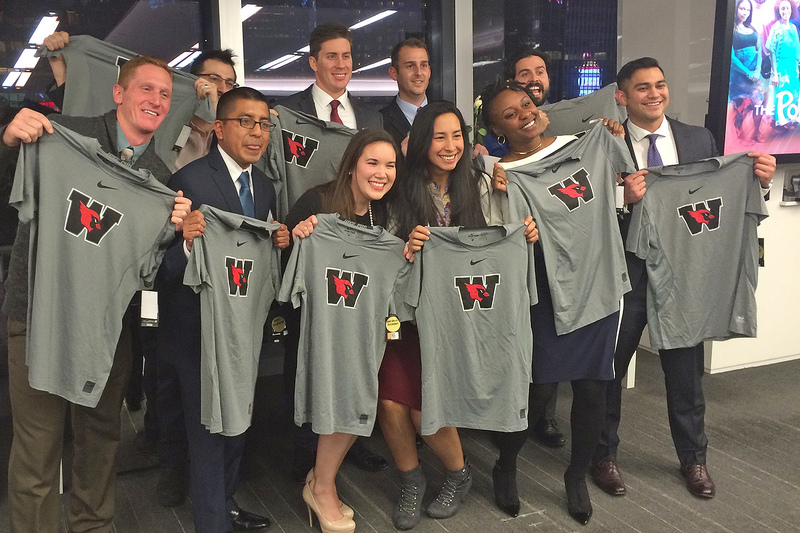 Before arriving at Wesleyan, members of the Class of 2018 Posse Veteran Scholars were members of the Army, Navy, Air Force, and Marine Corps, and several served in Iraq and Afghanistan. Some had previously attended other colleges and universities; two have families. Andrew Szegedy-Maszak, Jane A. Seney Professor of Greek, professor of classical studies, is the faculty mentor for the Class of 2018 posse. From left, Darryl Stevenson ’18, Ryan Poulter ’18, and Michael Smith ’18 at the Wesleyan Posse Veteran Pre-Graduation Celebration on May 26. Antonio Farias, vice president for equity and inclusion, Title IX officer, agreed. 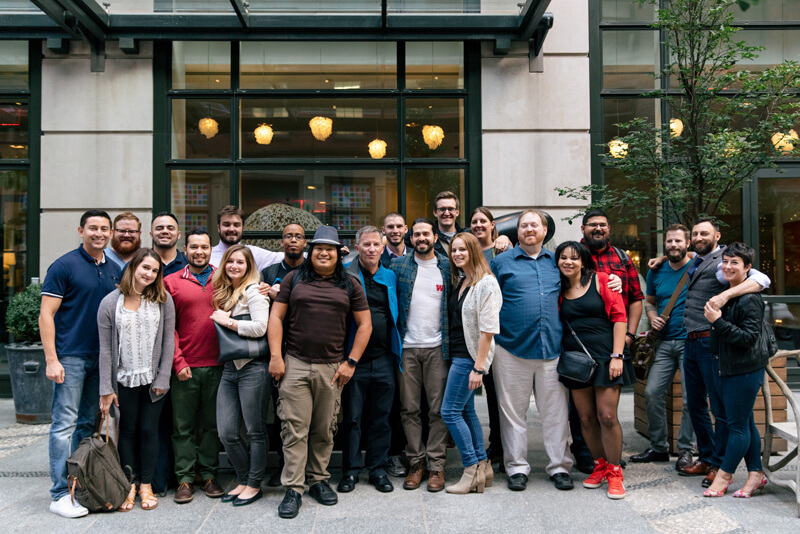 On May 20, the Wesleyan Student Veterans Organization (WESVO) hosted a two-hour formal reception to honor the U.S. and foreign service graduating veterans and show appreciation for faculty and staff that have aided in the accomplishments of the student veterans. Among those celebrated were Wesleyan Posse Foundation Veteran Scholar and U.S. Navy veteran Ky Foley ’17 and veteran Asad Hassanali ’17 of Singapore. Foley, who worked as a construction mechanic in the Naval Expeditionary Combat Command and served two tours in Afghanistan before enrolling at Wesleyan in 2014, is a member of inaugural “posse” of veterans at Wesleyan. Wesleyan’s Posse Foundation Veteran Scholars Program offers a four-year, full-tuition leadership scholarship to military veterans. Military veterans Asad Hassanali ’17 and Ky Foley ’17 are graduating on May 28. Wesleyan treated the veterans, including Wesleyan’s Posse Foundation Scholars, and their families to a brunch in Daniel Family Commons. Speakers included Wesleyan President Michael Roth; Antonio Farias, vice president for equity and inclusion; City of Middletown Mayor Daniel Drew; and veteran and Wesleyan alumnus Tim Day ’59. 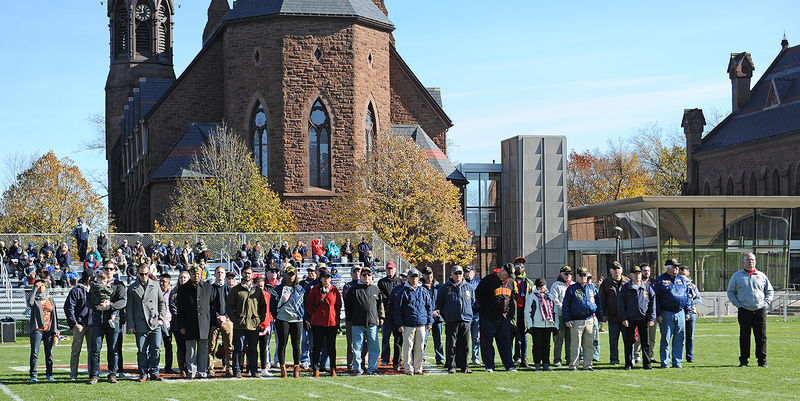 Following the program, Wesleyan’s Director of Athletics Mike Whalen ’83 led the veterans onto Andrus Field where they were greeted in the end zone by the Cardinal football players. The Middletown Police Bagpipe Association performed prior to the veterans’ public recognition. Tim Day, who served with the U.S. Marines, was named an honorary football captain and led the coin toss to start the game. Wesleyan’s Posse Foundation Veteran Scholars Program offers a four-year, full-tuition leadership scholarship to military veterans. 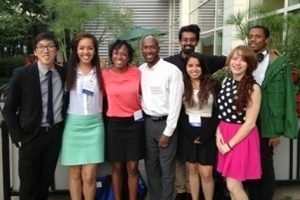 The Ronald E. McNair Post Program assists students from under-represented groups in preparing for, entering and progressing successfully through postgraduate education. This fall, the Office for Equity and Inclusion will coordinate five Wesleyan cohort programs: the Mellon Mays Undergraduate Fellowship, the Ronald E. McNair Postbaccalaureate Achievement Program, the Wesleyan Math and Science Scholars Program (WesMaSS), the Upward Bound Math-Science Program, and the Posse Veteran Scholars Program. The initiative is called Pathways to Inclusive Excellence (PIE). “It makes sense organizationally to place these programs under the same umbrella, in order to increase a sense of community amongst students, faculty and staff,” said Antonio Farias, vice president for equity and inclusion/Title IX officer. “Our vision is to increase the flow of students in grades 9 through 16 from historically underrepresented backgrounds and to provide opportunities and access by way of pathway programs that require complex thinking but also a complex interdisciplinary understanding of belonging in the pursuit of excellence. Wesleyan’s newest group of Posse Veteran Scholars. Back row, from left: Gregory Hardy, Andrew Daggon, Zachary Patterson, Daniel Rodriguez. Front row, from left: Lance Williams, Noel Salvador, Marisella Andrews, Rebecca Martinez, Gabrielle Hurlock, Mitchell Motlagh. This fall, Wesleyan will welcome to campus its third cohort of Posse Veteran Scholars in the Class of 2020—a group of three women and seven men who have served in all branches of the U.S. Armed Forces. They come from all over the United States and have served in places such as Afghanistan, Uganda and Iraq. Their interests range from visual art and filmmaking to teaching and mathematics. 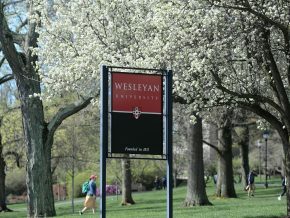 One student, Marisella Andrews, is the great-granddaughter of a Wesleyan alumnus, Matias Perez, from the Class of 1917. The group’s faculty mentor will be Jill Morawski, the Wilbur Fisk Osborne Professor of Psychology, professor and chair of Science in Society, professor of feminist, gender and sexuality studies. Trained in experimental psychology, Morawski has turned her scholarly inquiries toward seeking better understanding of the ways that scientific psychology has shaped American culture, policy and individual lives. “It’s exciting to have Professor Morawski join the team of deeply committed faculty mentors, without whom, this initiative would not succeed the way it has these past two years,” said Antonio Farias, vice president for equity and inclusion/Title IX officer, and Wesleyan’s Posse Veteran liaison. Read the original announcement about Wesleyan’s partnership with the Posse Foundation to recruit military veterans here, and see a recent PBS Newshour feature on Wesleyan’s Posse vets here. 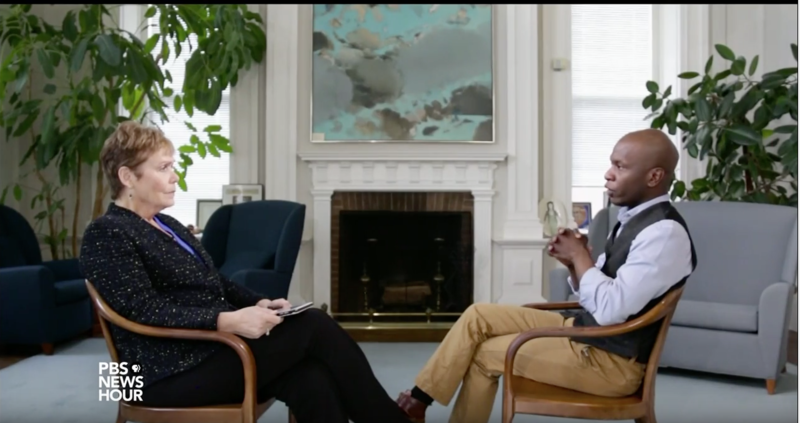 PBS Newshour’s Jackie Judd interviews Michael Smith ’18 about his experience at Wesleyan as a Posse Veteran Scholar. 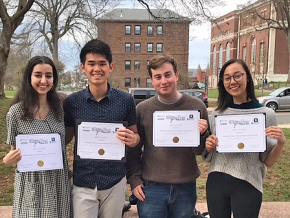 On March 15, Wesleyan’s Posse Veteran Scholars program was spotlighted on PBS Newshour, in an episode featuring interviews with President Michael S. Roth and several students. Wesleyan is first mentioned around 3 minutes with Michael Smith ’18 speaking. According to the show, more than 1 million vets are using GI benefits, but most attend public or for-profit schools. The number of veterans attending top-tier colleges “is so small, it’s not even known.” A few years ago, the Posse Foundation—which has a long history of sending groups, or posses, of talented students “who don’t fit the mold” to top colleges—started a program focused on military veterans. Wesleyan welcomed its first posse of veterans to campus two years ago and, this spring, will admit its third. 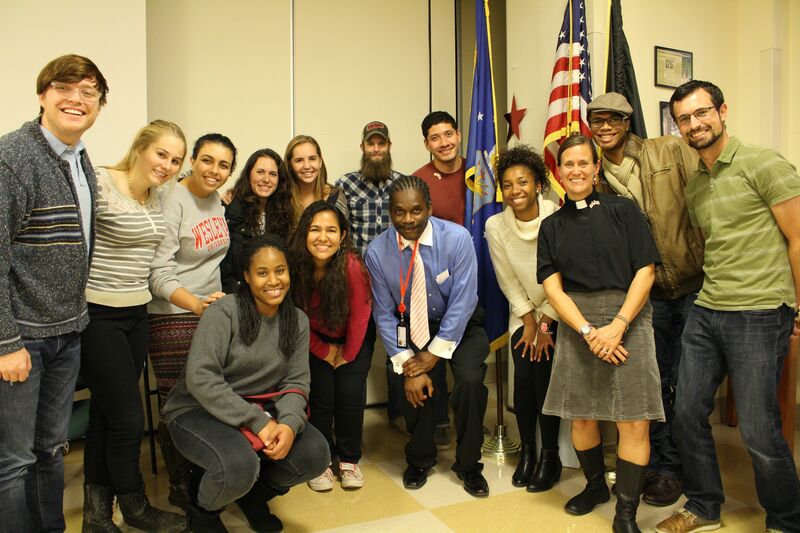 Vassar and Dartmouth colleges also participate in the Posse Veteran Scholars program. Judd also interviewed Bryan Stascavage ’18, an Iraq war veteran and a conservative, about finding himself in the middle of a “culture clash” on campus this fall after he penned an article critical of the Black Lives Matter movement. 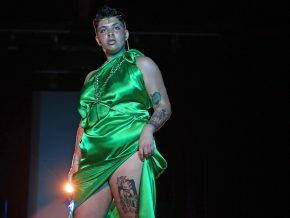 “I knew that the articles I was writing were not the prevailing opinion on campus, and I knew that it was only a matter of time when, I like to say, that I connect with the beehive,” said Stascavage. “Unlike a fighting unit, where you really need cohesion and you all have to point in the same direction, at a university you can afford dissent and controversy as long as you learn to listen while that’s going on,” said Roth. Though difficult in the moment, Roth said, the episode was a positive “teachable moment” for the community. “That’s what you want. 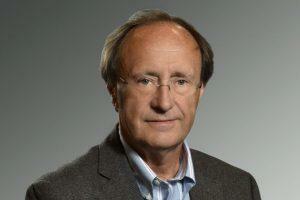 Because if you’re learning to listen, you’re learning to learn,” he said. “I don’t want to be in an environment where everybody thinks the same as me, because you just don’t learn that way,” added Stascavage. A group of Wesleyan students, led by University Protestant Chaplain Tracy Mehr-Muska, visited the Connecticut State Veterans Home in Rocky Hill on Nov. 8, just ahead of Veterans Day. The 12 students—including two Posse Veteran Scholars—visited with the veterans, sang patriotic songs, and pinned American flag pins on their lapels in honor of their military service. They were joined by Mehr-Muska’s chaplain intern from Yale Divinity School, Jonathan Heinly, and the chaplain at the Veterans Home. Among the veterans they met was a 101-year-old man who served as a member of the Tuskegee Airmen. Dennis White ’19 is one of 20 Posse Veteran Scholars at Wesleyan. (Photo by Mark Mirko/ The Hartford Courant). For more than two decades, Posse has run a program on the principle that high school students from diverse backgrounds will have a better chance of becoming successful students and leaders on campus if they come in a tight-knit group and with a network that helps to support them. 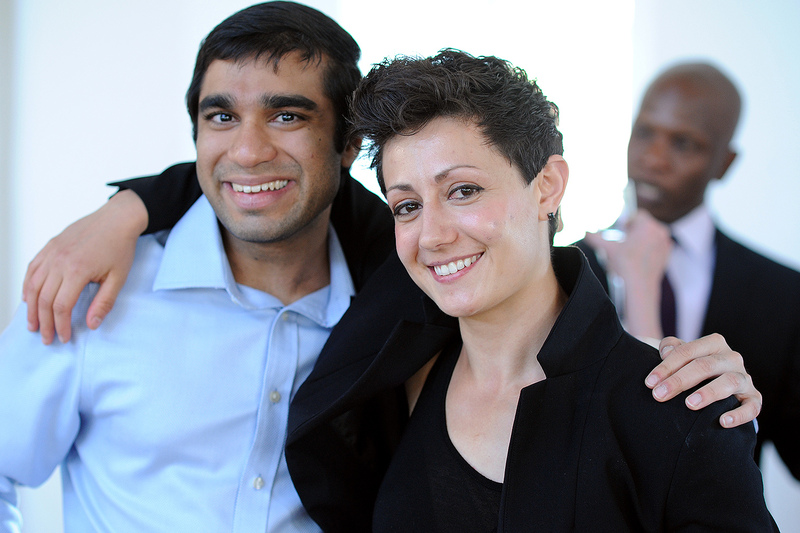 Two years ago, Posse expanded that concept to teams of veterans, starting at Vassar College. 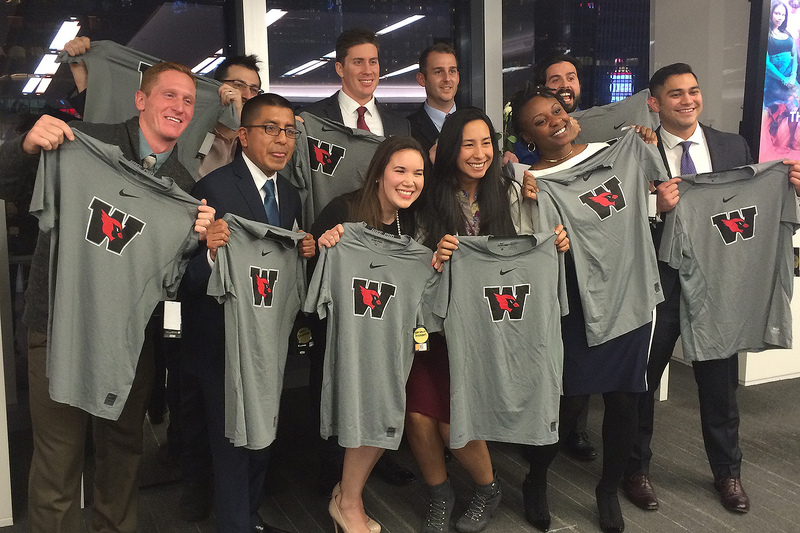 Wesleyan had its first posse of 10 veterans enter last year, and a second posse of 10 more this fall and will add 20 more over the next two years. 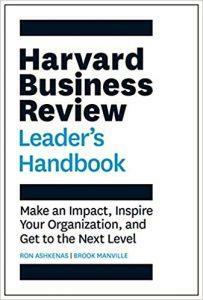 Next year, Dartmouth College plans to become part of the program. As part of the arrangement, the schools agree to pick up whatever costs the federal veterans programs don’t cover. 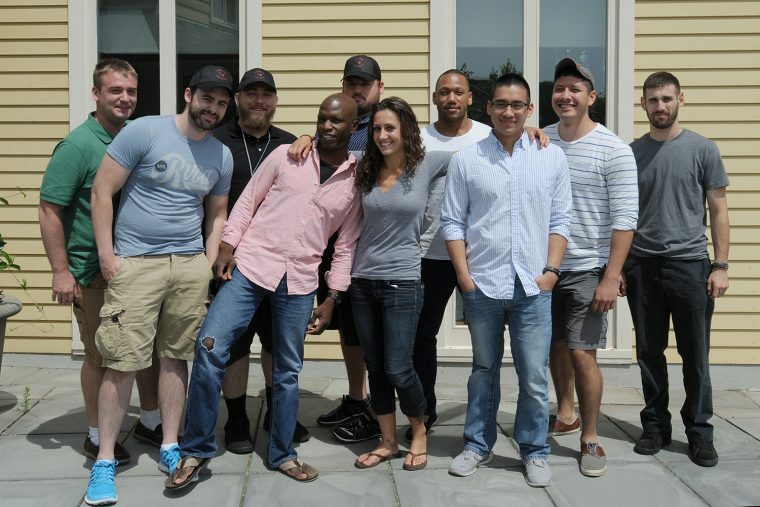 In 2013, Wesleyan decided to partner with Posse because the university was having a hard time attracting veterans on its own. “Wesleyan is known as a school pretty much on the left …” President Michael Roth told the Courant, “but a school that’s only on the left and seems hostile to anything that’s not stereotypically on the left is a school that would be weak, I think. It would be an echo chamber, rather than a place of real conversation and debate. 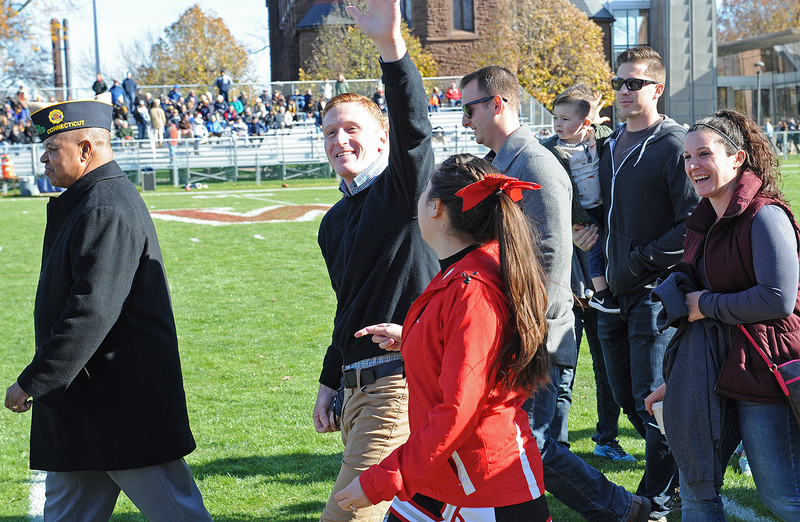 The article leads with Army veteran Ryan “Doc” Polk ’19, who admits he was elated but “terrified” to start at Wesleyan. But Polk, who is 32, says his experience in a “posse” of 10 veterans at Wesleyan has allayed his reservations. He has found the students open and easy to talk to, and he’s taking every class he can cram into his schedule. 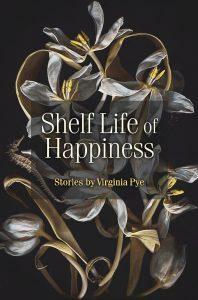 His career plan to drive a truck has given way to plans to become a writer. It’s part of the reason “Doc” doesn’t go by his old name — Ryan — anymore. “I don’t even know that guy anymore,” he said. 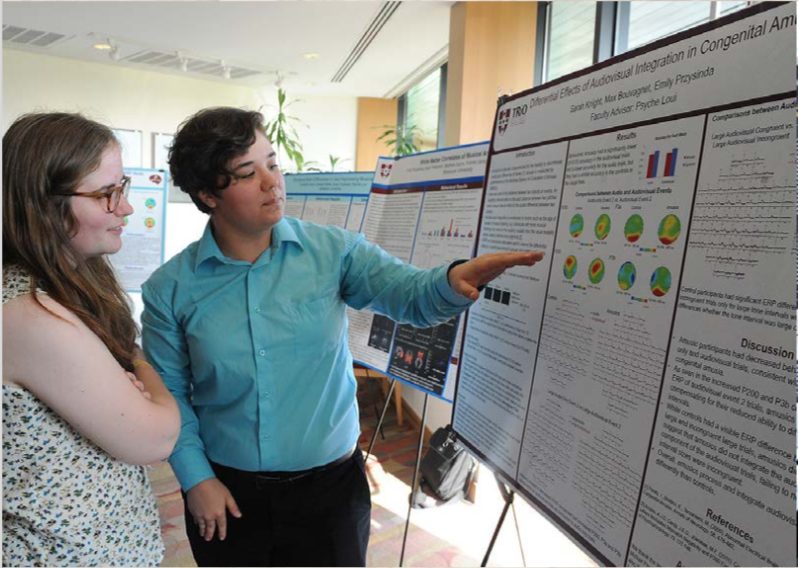 The article also describes the role of faculty mentors for the Posse veteran scholars. 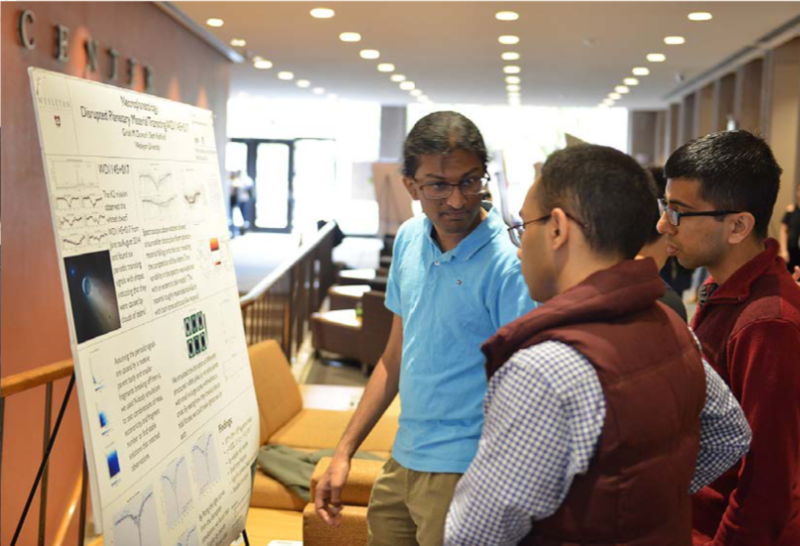 As part of the Posse program, Wesleyan faculty mentors provide close advising to Posse students, meeting with them one-on-one and in groups. In addition, Posse Foundation staff visit the campus several times a year. 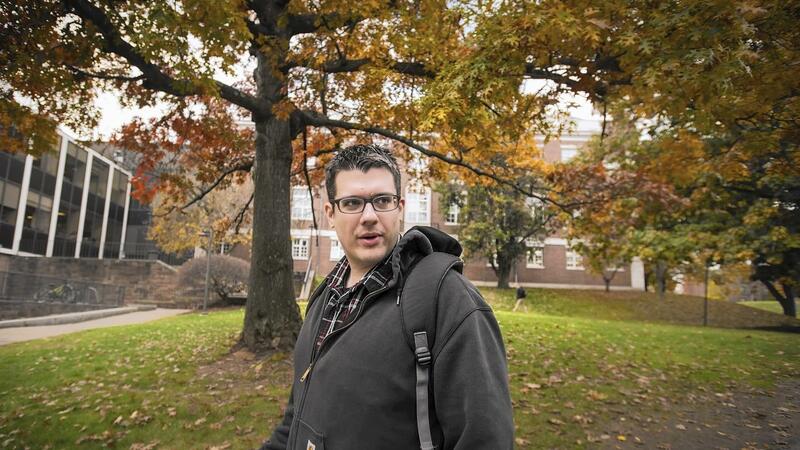 Andrew Szegedy-Maszak, a professor of Greek and Classical Studies and a faculty mentor, said that one of the biggest issues veterans face is the “impostor syndrome,” which was discussed in the ’70s and ’80s. Many of the veterans had unsuccessful high school careers or attended community colleges, where they were “racking up A’s,” Szegedy-Maszak said. While having a posse of older students with shared military experience is helpful, Antonio Farias, Wesleyan’s vice president for equity and inclusion, said the students are expected to get out of their “comfort zones,” become leaders on campus and participate in extracurricular activities. The Christian Science Monitor also interviewed Polk for a story about the challenges veterans face when entering college after military service, and programs designed to help them. President Michael Roth told the Monitor about why Wesleyan brought the Posse veterans program to campus. “We’ve been engaged in a series of wars that haven’t even been labeled wars, and they demand an enormous sacrifice from a very small percentage of the population, and the rest of us depend on that sacrifice whether we like it or not, but never really have to talk to somebody who patrolled the streets of Iraq or the mountains of Afghanistan,” he said. The Office of Equity and Inclusion sponsored a day-long writing symposium on “Words after War: Storytelling for Life, Business and Politics” Oct. 10 in Usdan University Center. The symposium, which was open to military veterans, Posse Veteran Scholars, Wesleyan students and community writers, provided thoughtful, diverse conversation and writing about conflict and how to bridge the veteran/civilian divide. More than 45 people registered for the event. 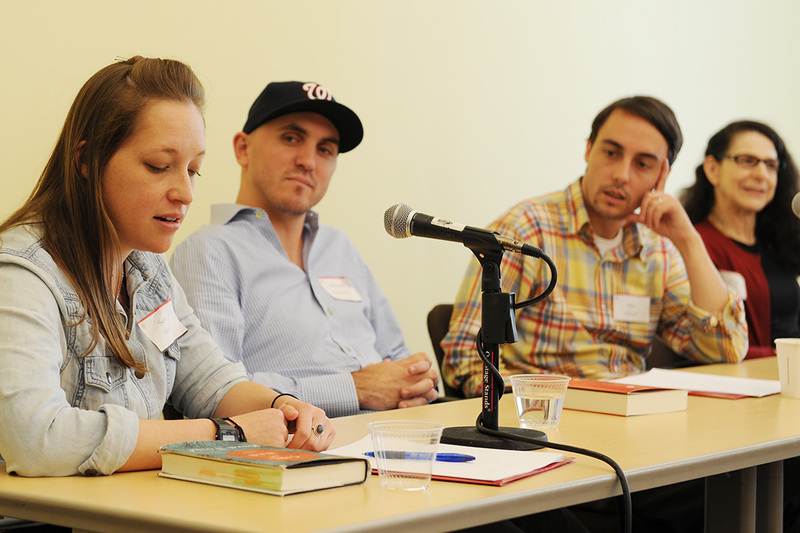 The symposium featured panel discussions and breakout workshops with authors. Participants learned valuable and practical writing techniques and left with a newfound sense of empowerment and inspiration in producing art that builds community, makes an impact, and reaches a wider audience. Moderators from Wesleyan included Anne Greene, University Professor in English, director of the Wesleyan Writers Conference, and William “Vijay” Pinch, professor of history, professor of environmental studies, chair of the College of the Environment. Other instructors included Brandon Willitts, executive director and co-founder of Words After War; Lauren Katzenberg, managing editor of Task and Purpose, a digital news and culture publication covering military and veterans issues; Kristen Rouse, the founding director of the NYC Veterans Alliance; Peter Molin, a retired West Point English faculty member and officer with deployment experience to the Sinai, Egypt, Kosovo and Afghanistan; Vanessa Gezari, managing editor of Columbia Journalism Review and an adjunct professor at Columbia Journalism School; Thomas Gibbons-Neff, national security journalist for the Washington Post and former Marine infantryman; and authors/editors Adrian Bonenberger, Sara Nović, Maxwell Neely-Cohen and Matt Gallagher. View the instructors’ full bios here.